Bhallaladeva meets a mysterious new woman and decides he must marry her. Bijjaladeva, however, cannot accept this woman as his son's new bride and puts a sinister scheme into motion to protect his son. 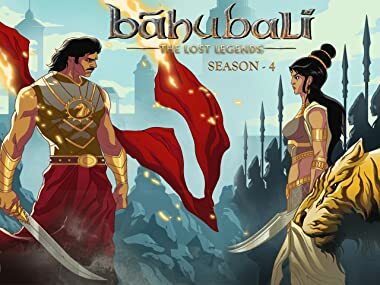 When an evil tyrant terrorises innocents, it is up to Baahubali and Bhallaladeva to find a way into the fortress atop a high mountain and free people from his cruel reign. Baahubali discovers that an old friend with a long memory needs his help and pledges his assistance. Bhallaladeva, however, has other plans for Baahubali's friend. Peasants living in the outskirts of Mahishmati are in desperate trouble. The only man who can save them is the fabled Bandit King but in doing so he becomes a target of Mahishmati! The Bandit King has become a thorn in Mahishmati's side but Bhallaladeva has vowed to bring the brigand to justice, no matter the cost. Baahubali gets his purse stolen in Mahishmati market and pursues the thieves. This leads him to a dark underbelly existing under Mahishmati that he had no idea existed. Baahubali wakes up in a strange, unknown place without knowing how he got there. What's more, he discovers he's not alone. The only way back home to Mahishmati is to escape the deadly puzzles of the labyrinth! People are starting to get killed in Mahishmati and Baahubali suggests a sinister hand is at fault. His investigation leads him to confront something dark growing within the heart of Mahishmati itself. Baahubali discovers the dark secret operating inside Mahishmati and realizes he has to destroy it. However, other malevolent forces at work have decided that they have to stop Baahubali, even if they have to kill him to do it! A new evil threatens the sovereignty of Mahishmati and Baahubali must find out more before he heads out to confront it head on! Reuniting with his old friend Mahabali from the Tournament of Champions, Baahubali learns just exactly what being the outsider in a society of nomads means. Katappa has been accused of murder but Baahubali cannot believe his teacher and friend is guilty. In a race against time Baahubali must uncover the truth before Katappa faces deadly justice at the hands of Bijjaladeva. Desperate to find an ally in their darkest hour, Mahishmati tries to turn an old enemy into a friend. But old wounds seldom heal and hatred runs deep. Baahubali is deeply conflicted when a pair of Kalakeya arrive seeking refuge in Mahishmati warning them of a dire fate about to descend on their kingdom! Mahishmati's darkest hour has arrived! The kingdom is under siege and all hope seems lost! It is now up to Baahubali, Bhallaladeva, Katappa, and Rajmata Sivagami to turn the tide! Without any allies, without any friends, without any saviors, Mahishmati is under siege and its attackers seek nothing less than to burn the kingdom to the ground!